Myron Ebell is Director of the Competitive Enterprise Institute’s Center for Energy and Environment. He provides the following background on what is happening with President Trump’s possibly wavering promise to withdraw the United States from the heavy-handed Paris climate (non)treaty. He urges Americans to watch CEI’s short new video (above) and sign a petition asking the President to keep his vitally important promise. Informative talking points, articles and blog posts follow the link to the CEI video. 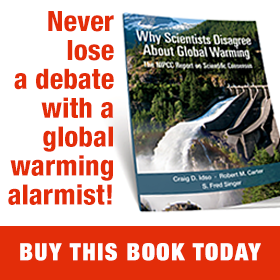 Cal Beisner’s article is especially valuable, as it succinctly presents the most important reasons the United States and President Trump should take a seat at the head of the table, and lead the world away from this disastrous agreement – which would destroy modern industrial economies, distribute their wealth to other nations, and do virtually nothing to reduce future global warming or prevent future climate changes or extreme weather events. Ebell says Trump Administration senior officials will meet at 1:30 this afternoon (April 17) to try to come to a consensus on what to do about keeping President Trump’s campaign promise to withdraw from the Paris Climate Treaty. It is his understanding that the meeting will probably not agree on a recommendation to President Trump, who will make the final decision in the coming weeks. It is also his understanding that those in favor of keeping the President’s campaign promise and those in favor of breaking it are fairly evenly balanced. This is contrary to news reports that the promise-breakers are on the verge of winning. One concern is that Energy Secretary Rick Perry appears to have gone wobbly. This battle between the American “Deplorables” and the Washington Swamp has monumental consequences for our access to reliable, affordable energy, and thus for our future lives, livelihoods, living standards and liberties. Please watch the video and sign the petition. Then send the link to friends, family, colleagues and appropriate people you know in the White House and Congress. Urge them to watch the video and to pass it along to others. For those on Twitter, the President’s handle is @realDonaldTrump. President Trump campaigned on the promise to “cancel the Paris climate agreement and stop all payments of U.S. tax dollars to UN global warming programs.” The agreement is designed to transfer wealth from the United States to developing countries, and would cost trillions of dollars to implement. The Paris Agreement is an unfair deal that allows countries like China and India – which have far fewer environmental protections in place than does the U.S. – to continue to increase their greenhouse gas emissions, while we take very costly steps to dramatically decrease ours. The promises made by the Obama administration in entering the agreement would cost American workers hundreds of thousands of jobs, and our economy hundreds of billions of dollars – harming America’s competitiveness in the global marketplace, and handing an advantage to China and other nations. Because the Paris Agreement requires member countries to increase their emission reduction commitments every five years, staying in the agreement would mean even more harm to American workers, families, and the economy over time. This stands in direct conflict with President Trump’s plan to create 25 million new American jobs, re-establishing the United States as a global leader in manufacturing and an engine of economic growth. Some argue that we should remain in the Paris Agreement to keep our “seat at the table.” However, the fundamental goal of the Paris Agreement is to drive participating nations toward emissions reductions that are mathematically incompatible with economic growth. Furthermore, remaining in the agreement and reducing our Nationally Determined Contribution (NDC) is inconsistent with the construct of the agreement itself. Provisions exist only for participating nations to strengthen their commitments, not weaken them. Even providing for a rescission of our current NDC, continued U.S. participation in the agreement ensures a future administration will once again put forward unattainable, economically damaging NDCs. It is also unrealistic to believe that the U.S. could extract concessions regarding the development and use of fossil fuels, particularly given the negative reaction by other members at the recent G7 Energy meeting to a proposal to include reference to fossil fuels in a joint statement of the G7 nations. In stark contrast to the previous administration, President Trump has made clear that his priorities include energy policies that maximize the use of America’s vast untapped resources; environmental policies that focus on protecting and preserving our air, water, and wildlife; and regulatory policies that put Americans back to work, unleashing our nation’s full economic potential. The Paris Climate Treaty stands as an obstacle to each of those goals. Which President Colluded with Russia?